CleverQ reports designer software is a business reporting tool with powerful features for laying out & formatting reports, connecting to multiple data sources and types, and producing output either immediately or based on a schedule, in a variety of formats. 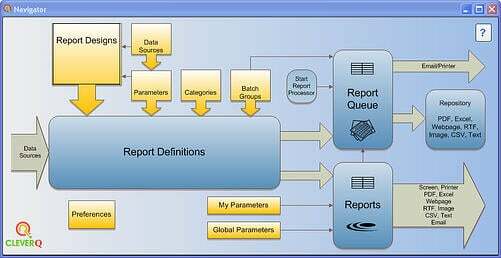 Create reports from almost any data source including Microsoft Access, or any ODBC source including SQL Server, MySQL, Oracle, QuickBooks® QODBC, etc. Reports saved as HTML are added to a Local Home page for viewing via a web browser. A specific report can be previewed on the screen by passing a command line argument when opening the software (useful when integrating with other applications).